The Heart of Illinois United Way is focused on ensuring the people of central Illinois have access to quality, affordable health care. The health and well-being of our citizens is a strong indicator of the health of our community. United Way funded health programs provide . . . Routine medical exams are critical to identifying and treating health concerns before they become more serious and costly. Heartland Health Services serves a growing segment of the population, spanning all ages that lacks access to quality health care. When faced with a need for care many do without because they have little to no insurance, little or no money, and are ineligible for government assistance programs. Adults and children who are underinsured are less likely to access preventative care and ultimately go without treatment. This creates a cascade effect that can reduces performance at school and reduce financial stability if wages are lost. By providing checkups, Heartland is positively impacting the link between education, financial stability and health. Individuals and families in crisis need immediate assistance and stabilization in order to lead stable, self-sufficient lives. Crises that threaten health, safety, housing and employment can hinder progress toward independence and self-sufficiency. The Heart of Illinois United Way invests nearly $627,000 annually in crisis services. Programs include disaster services when a fire or tornado damages or destroys a home or business, emergency child care, medical and court services for victims of domestic violence or sexual assault, therapeutic interventions for children to prevent a mental health crisis or hospitalization, or legal interventions when housing or health are threatened. If you give $1 a week, you can provide a stable adult volunteer for one year to look out for the best interests of a child who has experienced abuse or neglect and is navigating the court system. If you give $10 a week, you can provide 45 hours of round-the-clock safe child care for families facing crisis or parental stress, in order to prevent child abuse or neglect. Health education teaches critical life skills that improve nutrition, increase exercise, and emphasize smart choices. 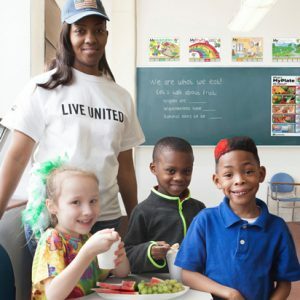 The Heart of Illinois United Way invests more than $300,000 annually in programs that provide nutrition and fitness programs for children and adults. These in-school and community-based programs are easily accessible and improve our community’s overall health and well-being. At the Boys and Girls Clubs of Greater Peoria, their Healthy Habits program addresses hunger and healthy food choices with a two-fold approach. With many low-income children receiving meal assistance at school during the week or nutritious snacks afterschool, they are often left hungry over weekends. The Boys and Girls Clubs program ensures children and families are nourished each weekend by sending home nutritious, easy-to-fix meals while also providing opportunities for parents and children to learn how to select and prepare healthy food on a budget. Adverse Childhood Experiences, including stressful or traumatic events and child abuse/neglect, are significant risk factors that have been linked to risky behaviors, victimization, violence, and chronic health conditions. Assuring safe, stable, nurturing relationships and environments are critical for mitigating the effects of adverse childhood experiences. 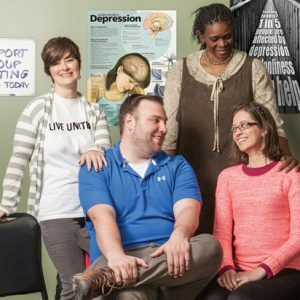 The Heart of Illinois United Way invests more than $500,000 in mental health services that address adverse childhood experiences and untreated mental health issues that can affect the entire family. Programs include individual and family counseling services, specialized therapy services for victims of sexual assault or domestic violence, and behavioral interventions to improve a client’s ability to remain housed or obtain/retain employment. If you give $7 a week, you can help a family become stable and improve their relationships and home life through counseling and case management for issues such as separation or divorce, abandonment, anger, or substance use. If you give $20 a week, you can provide 8 weeks of therapy for an adult or a child as young as 2 to reduce the impact of trauma from sexual assault or domestic violence. The Heart of Illinois United Way funds individual, family and group counseling for at-risk individuals including programs at the Center for Youth and Family Solutions (above). Our emotional, psychological, and social well-being affects how we handle stress, relate to others and make health and life-style choices. Mental health is important at every stage of life, from childhood and adolescence through adulthood. For a complete list of United Way Funded Health-Related programs, click here. Many mental and physical health issues affect children’s ability to have healthy relationships and to be successful in school. 1 in 4 children are bullied at school. Significant numbers of children experience the effects of anxiety, depression, and abuse or crises at home that affect learning. These issues may cause children to act out, experience difficulty in relationships with friends and family members, and interfere with daily functioning. Physical health issues, including hunger, poor nutrition, obesity, and lack of exercise may also present barriers to health. The Heart of Illinois United Way invests more than $450,000 in youth health education programs that promote safety, mental health, and physical health education. Providing education on health related topics and giving children an opportunity to seek additional services for specific issues promotes health and well-being for a lifetime, and also helps children recognize that asking for help is important. If you give $3 a week, you can provide a preschool or school age child with 1 week of summer camp that focuses on nutrition, physical fitness, and health education. If you give $7 a week, you can provide a 12 week anti-bullying course to one third grade student to help him/her feel safe and learn tools to prevent or handle bullying. If you give $10 a week, you can provide one semester of weekly counseling sessions to a middle school student dealing with anxiety or depression. To see United Way funded health programs at work visit our YouTube channel. Physical health issues for adults are also significant concerns in our community, including complications from obesity, lifestyle choices including nutrition and fitness, substance abuse, and sexually transmitted infections (STIs). 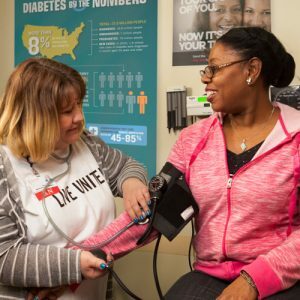 The Heart of Illinois United Way invests more than $200,000 in programs that support and promote physical health for adults. Programs include nutrition and fitness education, testing and treatment for STIs, diabetic case management, healthy lifestyle education for adults with developmental disabilities, and services to blind and low-vision clients to help them remain independent in their own homes. If you give $1 a week, you can provide weekly fitness classes for one year for 5 participants to encourage exercise as part of a healthy lifestyle. If you give $3 a week, you can provide two clients with low vision an assessment and adaptive in-home magnifiers/other aids to help them remain independent in their homes. If you give $5 a week, you can provide weekly visits for one year of diabetic case management services to improve health and quality of life for high-risk diabetic patients.